Large scalp defects after accidents or tumour surgery represent a challenge for the surgeon. If the closure has to be combined with other techniques like cranioplasty, the planning of such a surgical procedure needs to address several concerns. Often, a step-by-step technique offers a greater flexibility and, potentially, a better outcome than single-step approaches. Interdisciplinary team work is most helpful. Here, we report our experience with the reconstruction of a complex head injury after a severe traffic accident. We want to emphasize the opportunities offered by new technologies, such as artificial dermal matrices and osmotic tissue expanders, to solve such problems, with maximum benefits for the patient. A 31-year-old male patient presented with a skin defect on the left temple of about 6 cm in diameter after a traffic accident with severe cranial injury and fracture on the left frontal and temporal sites. Decompressive craniectomy was performed to treat intracranial hypertension refractory to medical therapy due to subdural haematoma. The soft tissue defect on his left temple resulted from traumatic descalping. Exposed bone could be seen at the margin [Figure 1]. Because the patient was in neurologic rehabilitation, primarily, a conservative approach was chosen. Cranioplasty with autologous bone graft or other reconstructive materials is generally considered as treatment options to repair the skull defect in such cases. In the present case, autologous bone was chosen for the planned cranioplasty. In the present case, we wanted to improve wound closure without grafting because cranioplasty was necessary to close the large bone defect eventually [Figure 1]. Eight weeks later, a stable epidermal cover and a slightly atrophic scar developed. Continuation of neurologic rehabilitation was possible without the risk of secondary infection. A cranioplasty with autologous bone was planned to close a large bone defect of the left os temporale. The bone had been preserved according to the procedure desribed by Osawa et al., with deep freezing and autoclaving before implantation. To reduce any post-operative risks for complications, the atrophic scar had to be removed (diameter 6 cm), which was located close to the bony defect. This would have left a large scalp defect. To obtain a tension-free closure of the scalp defect, we performed a two-step procedure. In the first step, a rectangular osmotic tissue expander of 30 mL with a final volume of 300 mL (Osmed GmbH, Ilmenau, Germany) was employed [[Figure 2]a]. After a 3cm long incision, the expander was placed in an occipitotemporal subgaleal pocket. This location is ideal because of its relative avascularity, which allows an atraumatic undermining with gloved fingers. The procedure was performed under general anaesthesia [[Figure 2]b]. Antibiotic prophylaxis with cefuroxime 500mg, bid was prescribed. Wound healing of the small incision was rapid and without complications. The final expander volume was achieved after 12 weeks. The continuous expansion was well tolerated, without the need of any analgesics during the whole 12-week interval [[Figure 2]c]. In a second session, the skull defect was closed with autologous bone by the neurosurgeon (YB). Antibiotic prophylaxis was performed using ceftriaxone 2 g/day i.v. (Rocephin, Hoffmann-LaRoche). The atrophic scar of about 6 cm in diameter was excised. After removal of osmotic tissue expander from its pocket [[Figure 2]d] and wide mobilization of the scalp, the scalp defect could be closed without tension by a single rotation flap [[Figure 3]a]. The flap was prepared by mobilization of the soft tissue from the galea with a monopolar electrosurgical knife. A post-traumatic lateral brow ptosis of the left side could be corrected by a triangular excision of skin with subcutaneous tissue and double-layer sutures adjacent to the excision line for the rotation flap. Wound exudate and minor bleeding was collected by two Redon drainages, one for the skin covering the cranioplasty and the second for the scalp rotation flap. They were removed after 5 and 8 days respectively. The total amount of exudates collected was 150 mL. The wound healing was uncomplicated. Sutures were removed within the next 2 weeks. The functional and aesthetic outcome was good [[Figure 3]b]. Scar lines would be covered by hair. The healing of the autologous bone was controlled by magnetic resonance imaging. No significant bone resorption or bleeding was observed. We were challenged by several problems in this case. The first problem was a soft tissue defect with exposed bone on the left temple. The defect was close to the skull defect after decompressive craniectomy. We preferred a conservative approach using an artificial dermal matrix, MatriDerm; . A variety of dermal templates are available on the market currently for this indication. , The templates can be combined with a mesh-graft. In this particular case, the skin graft would have been unsuitable for the final cranioplasty. Cranioplasty was planned for the time after early neurologic rehabilitation. Cranioplasties to repair skull defects have an overall complication rate of about 16.4%. Patients with traumatic injuries who present earlier have a lower rate of complications than those who do not. Patients who received autologous bone graft placement have a statistically significant lower risk of post-operative infection (4.6 vs. 18.4%). We decided to remove the atrophic scar close to the bony defect before cranioplasty to further reduce any risk of complication. In conclusion, osmotic tissue expanders can be used to treat larger scalp defects without the need for repeated punctures. The adverse effects are mild (mild post-surgical pain, limited pain during osmotic filling) and tolerable. In this patient, cranioplasty was necessary to cover a large bone defect. To avoid the risk of secondary infection, the atrophic scar had to be removed. The primary skin defect was safely treated by dermal collagen/elastin matrix without the need of skin transplantation. An osmotic expander was used for tissue expansion, which provided the benefits of tissue expansion without the need for repeated filling procedures. In a two-step procedure, both the bony defect and the large scalp defect after scar removal could be closed. Autologous bone material was used for the skull. A rotation flap was developed after tissue expander removal allowing a tension-free wound closure. Large scalp defects need an individually tailored surgical approach. Interdisciplinary team work is most helpful. With the available techniques, even large defects and complicated situations can be treated. 1. Ryssel H, Gazyakan E, Germann G, Ohlbauer M. The use of MatriDerm in early excision and simultaneous autologous skin grafting in burns-a pilot study. Burns 2008;34:93-7. 2. Kolokythas P, Aust MC, Vogt PM, Paulsen F. Dermal substitute with the collagen-elastin matrix MatriDerm in burn injuries: A comprehensive review. Handchir Mikrochir Plast Chir 2008;40:367-71. 3. Osawa M, Hara H, Ichinose Y, Koyama T, Kobayashi S, Sugita Y. Cranioplasty with a frozen and autoclaved bone flap. Acta Neurochir (Wien) 1990;102:38-41. 4. Jantzen JP. Prevention and treatment of intracranial hypertension. Best Pract Res Clin Anaesthesiol 2007;21:517-38. 5. Mansbridge J. Skin tissue engineering. J Biomater Sci Polym Ed 2008;19:955-68. 6. Chen X, Chen H, Zhang G. Management of wounds with exposed bone structures using an artificial dermis and skin grafting technique. J Plast Reconstr Aesthet Surg 2010;63:e512-8. 7. Chang V, Hartzfeld P, Langlois M, Mahmood A, Seyfried D. Outcomes of cranial repair after craniectomy. J Neurosurg 2010;112:1120-4. 8. Onishi K, Maruyama Y, Sawaizumi M, Iwahira Y, Seiki Y. Usage of intra-operative scalp expansion for primary wound closure in cranio-facial operation. No Shinkei Geka 1997;25:795-800. 9. Hoffmann JF. Tissue expansion in the head and neck. Facial Plast Surg Clin North Am 2005;13:315-24. 10. Manders EK, Graham WP 3 rd , Schenden MJ, Davis TS. Skin expansion to eliminate large scalp defects. Ann Plast Surg 1984;12:305-12. 11. Rotondo M, Parlato C, Iaccarino C, Scrocca A. Tissue expansion in neurosurgical reconstructive technique: Case report. Surg Neurol 1995;43:201-3. 12. 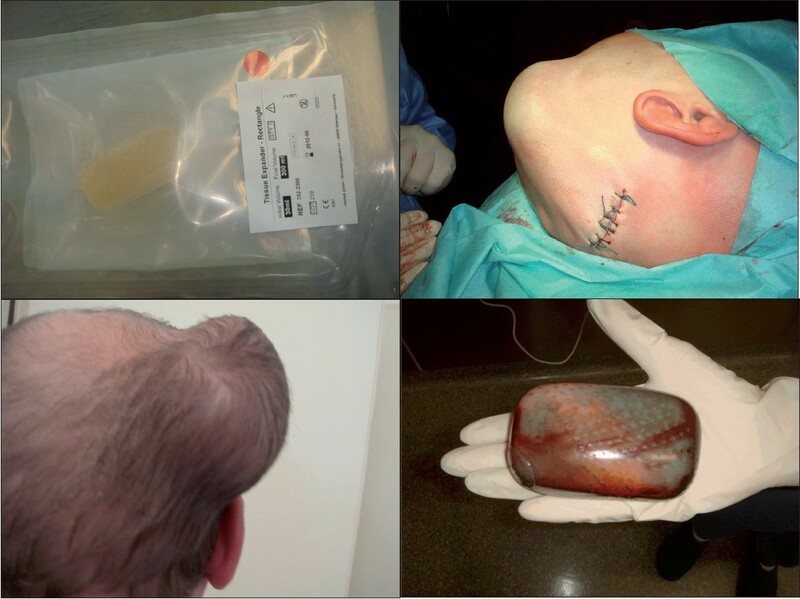 Berger U, Hyckel P, Schumann D, Wollina U. Reconstruction of large scalp defects by expander technique. Z Hautkrankh 1991;66:776-82. 13. Gόrlek A, Alaybeyoπlu N, Demir CY, Aydoπan H, Bilen BT, Oztόrk A. Aesthetic reconstruction of large scalp defects by sequential tissue expansion without interval. Aesthetic Plast Surg 2004;28:245-50. 14. Miyazawa T, Azuma R, Nakamura S, Kiyosawa T, Shima K. Usefulness of scalp expansion for cranioplasty in a case with postinfection large calvarial defect: A case report. Surg Neurol 2007;67:291-5. 15. Dotan L, Icekson M, Yanko-Arzi R, Ofek A, Neuman R, Margulis A. Pediatric tissue expansion: Our experience with 103 expanded flap reconstructive procedures in 41 children. Isr Med Assoc J 2009;11:474-9. 16. Becker S, Saint-Cyr M, Wong C, Dauwe P, Nagarkar P, Thornton JF,et al. AlloDerm versus DermaMatrix in immediate expander-based breast reconstruction: A preliminary comparison of complication profiles and material compliance. Plast Reconstr Surg 2009;123:1-6. 17. Bozkurt A, Groger A, O'Dey D, Vogeler F, Piatkowski A, Fuchs PC, et al. Retrospective analysis of tissue expansion in reconstructive burn surgery: Evaluation of complication rates. Burns 2008;34:1113-8. 18. Wiese KG. Osmotically induced tissue expansion with hydrogels: A new dimension in tissue expansion? A preliminary report. J Craniomaxillofac Surg 1993;21:309-13. 19. Weise KG, Heinemann DE, Ostermeier D, Peters JH. Biomaterial properties and biocompatibility in cell culture of a novel self-inflating hydrogel tissue expander. J Biomed Mater Res 2001;54:179-88. 20. Anwander T, Schneider M, Gloger W, Reich RH, Appel T, Martini M, et al. Investigation of the expansion properties of osmotic expanders with and without silicone shell in animals. Plast Reconstr Surg 2007;120:590-5. 21. Ronert MA, Hofheinz H, Manassa E, Asgarouladi H, Olbrisch RR. The beginning of a new era in tissue expansion: Self-filling osmotic tissue expander - four-year clinical experience. Plast Reconstr Surg 2004;114:1025-31. 22. Bergι SJ, Wiese KG, von Lindern JJ, Niederhagen B, Appel T, Reich RH. Tissue expansion using osmotically active hydrogel systems for direct closure of the donor defect of the radial forearm flap. Plast Reconstr Surg 2001;108:1-5. 23. Obdejin MC, Nicolai JP, Werker PM. The osmotic tissue expander: A three-year clinical experience. J Plast Reconstr Aesthet Surg 2009;62:1219-22.